The event ticketing revolution is here - are you on board? 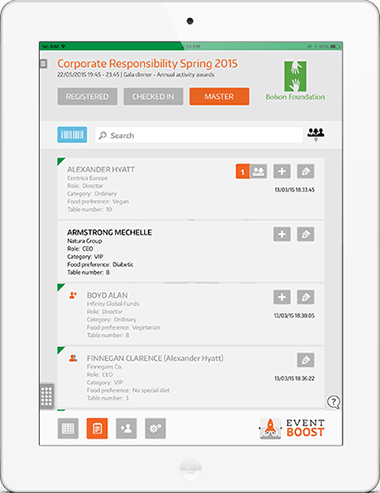 Eventboost is an event management software, which is simplifying complexity. It is possible to create events online, manage registration and share on social networks. Furthermore, Eventboost offers customized invitations, confirmation emails and online registration. It is easy to welcome guests with their check-in app or simply to print the badges with a QRcode. Monitor your event with real-time statistics, reminders and follow-up. You can get ready for the future, export lists or duplicate recurring events. Eventboost has two headquarters, one in Switzerland, Europe and one in New York City, USA. The platform is available in eight languages, front and back-end. Now they have a blockchain-based platform that connects event organizers to ticket buyers and enables them to sell and buy event tickets using crypto-tokens. The Eventboost Platform is fully operational since 2015, serving over 160 regular customers in 28 countries. Eventboost helps Event professionals and companies all over the world organize succesful and unforgettable events more efficiently and effortlessly. Eventboost will revolutionize the ticketing marketing with the launch of the EBT (Eventboost Blockchain Ticketing Platform). Through their Open API Infrastructure, EBT will also provide solutions for other kinds of tickets, including flight, train, bus and museum tickets. It will be the most secure and efficient blockchain-based platform to sell fraud-proof, smart contract tickets for b2b and b2c events. Event organizers will be directlz connected with ticket buyers, gaining total control of the entire ticket sale process and eliminating insane convenience fees, forever! With their GDPR compliant Privacy Solution, ticket buyers have full control of their personal data, deciding who can handle it, which data can be used and for how long.